My hubby surprised me today! He was granted permission to come home from training in the Army, but only for the weekend. They were given Friday and Monday off as well because of Columbus Day. He leaves early Monday morning, but I will see him again in mid November when he completes his training. I already miss him and he hasn't even left yet! I can't wait for the day we can be together permanently. I decided to make something special that I know he would enjoy, but yet keep me on my Weight Watchers plan so I made lasagna. 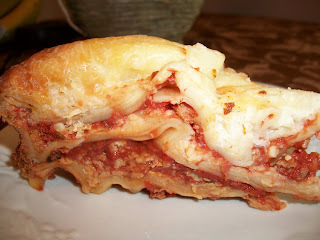 But not just any lasagna... a crockpot lasagna so that I can spend more time with him rather than in the kitchen. I had made the meat sauce the night before he came and through the rest together the day he arrived in the crockpot. Cooked it for only 4 hours and we had a delicious lunch and dinner! I did leave out the green peppers and mushrooms. I also added more basil, oregano, garlic powder, and onion powder to the sauce. I didn't measure the additional spices. I just sprinkled it in the sauce until I thought it was enough. Use your own judgment. It was sooo easy to put together and this truly does not taste like like a low fat "diet" recipe. My husband and his parents were quite surprised that this was a weight watchers recipe because it was very good and only 7 points to boot! I have to say that this is my favorite dish so far. I paired it with a green salad. I give it two thumbs way up! In a frying pan, brown turkey with onion and garlic. Add spices and tomato sauce and paste, stirring over medium heat until warm all the way through. Mix cheeses in seperate container. Layer 1/3 meat sauce, 1/3 noodles, 1/3 cheese, and 1/3 vegetables in crockpot. Repeat 2 more times until all ingredients have been used. Cook on low 4-5 hours.